In the 65-year history of Mira Costa’s Fisher Gymnasium – soon to be gone but not forgotten, much like beloved former principal Carl Fisher — this had to be one of the most encouraging losses ever suffered by the Mustangs’ boys basketball team. After all, the Friday night semifinal of the Pac Shores Tournament was supposed to be an early-season mismatch. Rolling Hills Prep, ranked No. 2 in CIF-Southern Section Division 3, is a hoops heavyweight with a dominant, 6-foot-8 Division I prospect in J.T. Tan and a legendary coach in Harvey Kitani. It was facing off against a scrappy, up-and-coming challenger with a brand-new coach and without a rotation player over 6-foot-3. Instead it turned into a nail-biting thriller for Mustang fans, with heavily favored Rolling Hills Prep just barely hanging on to a 50-47 win while surviving two last-second three-point attempts by Mira Costa’s best player, shooting guard Lucas Hobbs, that would have sent it to overtime. The narrow loss showed Mustang fans that signs of a promising new era under head coach Neal Perlmutter — Costa came into the game with a 7-1 record and ranked No. 6 in Division 3AA — were real, and could blossom into something special in the coming years. The Mustang’s stagnant offense of the past few years that featured mid-range jump shots was replaced by a more modern, dribble-drive offense featuring lots of man and ball movement designed to create driving lanes to the rim and open 3-point shots from the perimeter. It was a see-saw affair as RHP took a 21-17 lead into halftime. Tan dominated the painted area despite Costa swarming him every time the ball went down low. The lead grew to 28-19 in the third quarter before Costa launched a comeback led by Hobbs, a quick, 6-foot senior who spent his freshman year as a bench warmer on the Redondo varsity, sat out his sophomore year at Costa, and returned to hoops as a Costa junior becoming one of the leaders of last year’s team. Hobbs drilled a trifecta to pull Costa within 30-27, then he hit three free throws to keep it close at 33-30. A Matt Cammock power-drive got the Mustangs within a point at 35-34, and Carson Carey kept the comeback alive by nailing a three-pointer to make it 38-37 RHP. The fourth quarter saw more fast-and-furious action, as Tan repeatedly drove to the hoop and kept the Huskies barely in front. With two minutes left Tan hit two free throws to build the lead to 50-44, but with 25 seconds left Hobbs sank yet another trey to narrow it to 50-47. After grabbing a defensive board, Hobbs raced down court, missed a deep 3-point shot, chased down the rebound in the corner, and launched a potential game tying 3 that just missed as the buzzer sounded. While disappointed by the close loss, Perlmutter was pleased that the Mustangs responded so well to adversity. Tan led the Huskies with 20 points and 10 rebounds, while Hobbs led the Mustangs with 12 points, 8 rebounds and 5 assists. Bruising center Henry Householter chipped in with 9 points, 9 rebounds and ferocious defense against the much taller Tan. The win pushed Rolling Hills Prep into the finals, where it lost to Brentwood, and dropped Costa into the third-place game, which it lost to Mary Star (No. 15, Div. 3A) 63-55. Now Costa faces the problem of being a homeless team. “We’re going to be nomads for the next 18 months,” Perlmutter said. 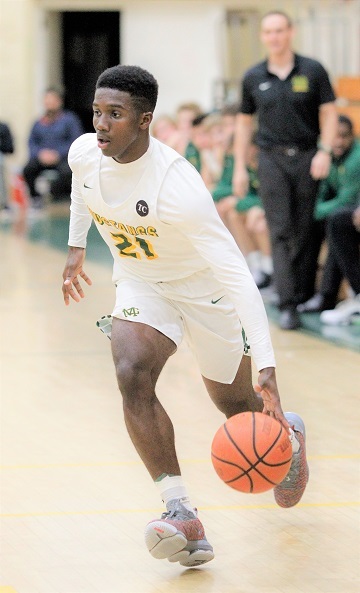 The Mustangs host Loyola Friday at 7 p.m. in Redondo’s small gym then Mira Costa plays Bay League contests Tuesday at Peninsula and hosts Palos Verdes (No. 2, Div. 3A) on Friday, Dec. 14. Home games will be played at several locations, he said. Fans should check maxpreps.com for the location of each game. “I’m going to be updating maxpreps as we go along,” he said. Despite the two losses, there was some good news for loyal, long-time Mustang fans: the new gym, which will be the centerpiece of the new athletic complex, will also be named Fisher Gymnasium. Redondo (3-2) began play in the Beverly Hills Tournament with a 72-13 rout of Reseda on Monday. The Sea Hawks open Bay League action Friday, Dec. 14 against Leuzinger (No. 16, Div. 2AA). Redondo fell to Etiwanda 50-39 in the semifinals of the Battle at the Beach tournament, where Bishop Montgomery (the third-ranked team in CIF-Southern Section Division 1) emerged as champions with a 59-50 victory over Etiwanda in the finals. Redondo (No. 9, Div. 1) is now prepared to make its run for the Bay League title beginning with road games at Centennial on Tuesday and Leuzinger on Friday, Dec. 14. The Sea Hawks host Foothill Tech in a non-league contest on Saturday, Dec. 15 at 5 p.m.
After two impressive wins against Palmdale and Los Angeles AES, Mira Costa dropped its final two games in the Brentwood Tournament. The Mustangs fell to Birmingham 52-48 then to La Canada 42-32. Mira Costa will be tested this week when the Mustangs open Bay League action Thursday hosting Palos Verdes (No. 16, Div. 2A), then will travel to take on South (No. 13, Div. 3AA) on Monday and Peninsula (No. 14, Div 3AA) on Tuesday. Contact: teetor.paul@gmail.com or follow: @paulteetor.